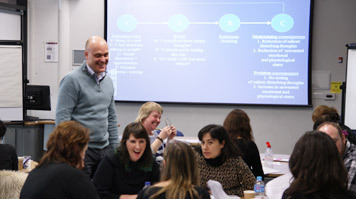 Professor of Psychology Marcantonio Spada delivered a workshop on Cognitive Behavioural Therapy (CBT) for problem drinking on Thursday 12 February at London South Bank University (LSBU). The workshop forms part of a series of CBT workshops facilitated by leading academic and expert practitioners, and organised by the School of Health and Social Care. Each workshop counts toward mental health practitioners' Continuing Professional Development. "I thoroughly enjoyed delivering this workshop to such a varied, experienced, and engaging group of professionals. The central message of the workshop, which I hope participants have embraced, is that a client-centred CBT formulation of problem drinking, together with ensuring that treatment is tailored to individual needs, is crucial for successful outcomes" said Professor Spada. Professor Spada is a leading academic and expert practitioner in CBT for problem drinking. He has authored over 50 international peer reviewed journal articles and three books on addictive behaviours. He is also Associate Editor of Addictive Behaviours and Editor-in-Chief of Addictive Behaviours Reports, two international scientific journals. "As a trainee CBT practitioner, I found the workshop very informative as it reinforced the idea of an individualised approach to CBT. It was great to have it delivered by such an innovative, enthusiastic leader in this field," said Bryn Williams, Senior Mental Health Practitioner at North East London Foundation Trust and MSc CBT trainee at LSBU. "This workshop is highly relevant to any CBT professional working in the field of addictions and I feel confident following the direction and guidance of such a distinguished expert in this discipline," said Alistair Bond, Therapist at CBT Clinic in London. "The workshop reintroduced old techniques that we've used before in a newer, devised approach. It is a really refreshing way of looking at current techniques," said Rhona Rafferty, Counsellor and Trainee Therapist on the PG Dip in CBT.